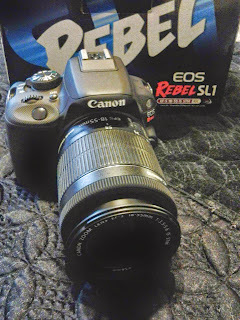 After nearly ten years of blogging, I have yet to own a digital SLR. I have been using a digital point and shoot for years and now I mostly use my phone's camera. Good food photography a digital SLR is essential. Canon is loaning me a camera to document my Thanksgiving. I will be taking photos and posting over the next two weeks. I got the camera via FedEx yesterday, and charged the battery last night. Here's my first selfie using the Rebel. I bought a rebel sl3 a month ago. It's their entry-level professional camera. As a fellow cupcake blogger, I tell you, you need one of these. It make everything look perfect.